I love theatre. As a former drama student, I live for live theatre, be that plays or musicals. When you realise you haven’t seen any live theatre for 6 months, something must be done about it. When I heard that Rupert Grint (Ron from the Harry Potter series) was going to be making his west end theatre debut, and what’s more be appearing alongside 4 other brilliant British actors from stage TV and film, I knew I wanted to go see it. The play had just been extended and I jumped at the opportunity to get tickets. 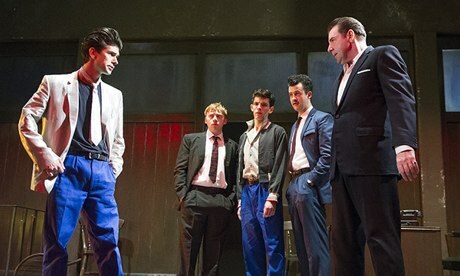 Mojo is a play by Jez Butterworth and is set in the 50’s entirely in a sleazy club, around a 24 hour period. When club owner Ezra is murdered, his son Baby (Ben Whishaw) and club workers struggle to remain calm after drink and drug infused partying. The play really highlights the power plays between the group, as they panic between themselves. As I said above, the cast really are absolutely fantastic in this, and the show is certainly one of the best ensemble cast performances I’ve seen for ages. As well as Grint who gives a brilliant performance as Sweets, a man that tends to follow the crowd and who gets freaked out easily. The comedy flair he showed in the Potter films flourishes in this role and he bounces off Daniel Mays who plays Potts brilliantly. Daniel Mays has a flair about his performance and gets some brilliant gags in the play. Colin Morgan (best known as the title role in Merlin) plays Skinny usually calm but constantly being abused by Baby. At one point Morgan is tied to a record player with his trousers down as Whishaw’s Baby brandishes a sword at him. For me, Whishaw gives a powerhouse performance and steals every scene he’s in. Baby is quite unhinged, and Whishaw is amazing in the role, and what’s more he sings and dances. Rounding off the cast is Brendon Coyle as Mickey, the calmest of the bunch, he self-appoints himself as the leader and remains quite menacing throughout. The conclusion of the play is a shock but is performed wonderfully; Baby discovers that it was Mickey that helped kill his father and in an argument with Skinny he shoots him. Despite trying to help and calm him down, Skinny dies and the group disperse, Sweets and Potts running into the night; and Mickey breaking down in despair. The final member of the cast is relative newcomer Tom Rhys Harries as Silver Johnny – it’s a shame the character didn’t have a bigger role as even though he is mentioned throughout he’s only in two scenes. Helping to uncover the mystery of Ezra’s death, he and Baby disappear into the night. The play was absolutely fantastic and a brilliant ensemble cast. The show ends its run this week, but I’m so glad I saw this play – a funny comedy but with a stellar cast that managed to make every moment count. The episode picks up right where part 1 finished: the battle is still raging on with Arthur and his men breaking a sweat fighting Morgana’s forces, whilst Merlin rushes to the battle, to be by Arthur’s side and stop the prophecy from coming true. Even though Merlin produces his most powerful magic yet, with bolts of lightning from the sky, it doesn’t take long for the confrontation between Arthur and Mordred to take place. Gotta say I didn’t expect it to be over within 5 minutes, and quite so quickly. I was sad to see Alexander Vlahos go, and I’m sure we’ll be seeing a lot more of him in the future. Even though Arthur dispatches Mordred, Arthur is also wounded and the image of Merlin wandering through the masses of bodies in search of his friend is incredibly dark. As the battle dwindles, Gwen returns to Camelot, anxious, but hopeful that her husband is in fact alive. Having rescued him, Merlin finally chooses this moment to reveal the secret he has kept over the past 5 seasons – he has magic. The scene is terrifically acted by Bradley James as he takes in a range of emotions; disbelief, shock, denial and anger. It’s heartbreaking to see Arthur’s rejection of Merlin and later when Gaius comes to help Merlin, Arthur’s realisation that Gaius has known about Merlin all along is a great moment. 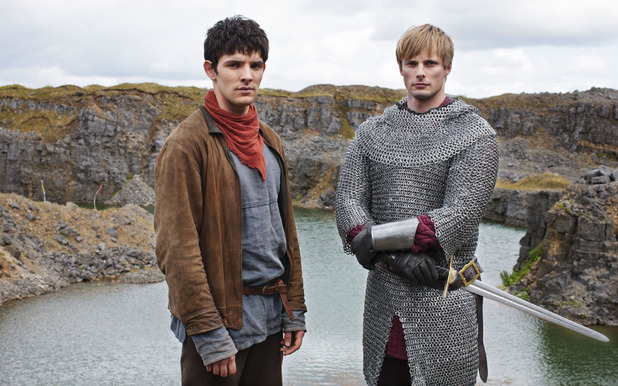 Most of the rest of the episode revolves around Merlin trying to get Arthur to the Lake of Avalon in order to save him. The sub-plot of Gwen running things back in Camelot, and her guessing that Merlin was the sorcerer on the mountain are interesting and a little too predictable, but I suppose hints have been dropped to her over the last two episodes and Gwen was always shrewd. We also get the other sub-plot of Gwaine and Percival going on a fool’s errand to try and kill Morgana who at this stage is completely broken, shrieking ‘I want him dead’ – a moment which is brilliant. Of course the knight’s quest doesn’t go to plan and poor Gwaine is tortured to death by the Nathair, ultimately revealing where Merlin and Arthur have gone. Speaking of Merlin and Arthur, they are still journeying towards the lake, and really the best moments from tonight’s episode are from them. Bradley James and Colin Morgan really have a great on-screen partnership and their relationship is tested in light of Merlin’s admission. You see moments where it is clear that Arthur is hurt and betrayed “You’ve lied to me all this time.” But as the episode goes on, you see Arthur slowly thawing, and realising that Merlin is still the same person – a true gift for the fans is seeing these two share so many beautiful moments together in this episode. The bromance runs into trouble when Morgana arrives to try and kill Arthur once and for all, and even though her death is again swift, Katie McGrath really utilises every moment, not over doing it and making it as powerful as possible. It seems that these diversions have taken too much time though, and with a final heartfelt and heartbreaking apology and “thank you” from Arthur, the King dies in Merlin’s arms. Even though Merlin tries to save him with help from the Great Dragon, John Hurt’s booming voice informs Merlin that the King is indeed dead, but that he will rise again, when Albion’s need is greatest. This entire sequence is incredibly moving to watch, and certainly bought a tear or two to my eyes. You can feel the raw emotion coming off of Colin Morgan, and watching Arthur float away in that boat was beautifully heartbreaking. The series ends with Gwen taking the throne, and a bizarre 30 seconds of Merlin, disguised as the old man, walking through present day Britain. The Diamond of the Day (part 1) was a slow-burner, but certainly set up the second part of the series finale, which now looks like it’s going to be a nail-biter of a last episode! The episode opens with Morgana revealing her most powerful weapon yet – a creature that has the power to steal magical powers. She puts it to good use, ridding Merlin of his magic, forcing him into a vulnerable and weak position. He ventures to the Crystal Cave, a place where magic is supposed to be born to try and retrieve his lost powers and help Arthur in the final batter. Speaking of Arthur, he has decided to meet Morgana and her forces head on at the doomed place of Camlann. Gwen is at his side, providing support and guidance. Back at the cave, Morgana has discovered Merlin’s plan and traps him there. Merlin is visited by the ghost of his father at his lowest moment, providing words of wisdom for him to realise his true destiny and potential. The episode ends with the battle just commencing and Merlin emerging from the cave as his true magical self – the old man Emrys. This episode was a solid start to the finale filled with some fantastic moments. We get a tiny glimpse of a confrontation between Morgana and Merlin, and Katie McGrath again puts in a great performance, as Morgana can finally see a way to achieve her goal. To see Mordred at her side is quite creepy, and even more so when he is slaughtering men whom he once fought alongside. There is also an incredibly touching moment in this episode and my personal favourite; a moment between servant and King where Merlin tells Arthur he cannot go with him to Camlann – it’s heartbreaking to watch, with Arthur telling Merlin he “was the bravest man I ever met” and Colin Morgan and Bradley James act out the scene beautifully. It’s touching to watch, and I’m only sorry that there weren’t more moments with the two of them – their relationship is really what is at the heart of this series, so hopefully they’ll be more scenes between these two in the last episode. With less than 24 hours to go before the final episode airs, the countdown is certainly on. I meant to finish this before the first-part of the series finale aired but I’ve been so busy with work. However, I still felt we should take a look back at episode 10 & 11. As we get closer and closer to the end of the series, the stakes are higher than ever for Merlin as his secret is looming closer to being revealed and Morgana becomes more fervent in her effort to find the true identity of Emrys and bring about Arthur’s downfall. Episode 10 revolves around an old acquaintance – Alator of the Catha, one of the only people to know Merlin’s true identity and someone that consequently, Morgana is extremely interested in. Whilst she tortures his mind and body to try and extract the information, it’s back to romance and grand gestures with Arthur and Gwen. Merlin soon gets dragged into the mystery of Alator’s disappearance, encountering the mysterious Druid priestess Finna. While Gaius is suspicious of her, Merlin chooses to trust her which forces Gaius into an awkward position – he tells Arthur of her existence which then causes the knights to go in search for her. As well as the knights looking for her, Morgana learns of her existence from her master Alator (so in fact she was trustworthy) and launches her own hunt for her. With both parties closing in, Merlin has to think fast (while injured) and after imparting wisdom and a further warning about Mordred, Finna sacrifices herself so that Morgana does not find out Merlin’s identity. Alexander Vlahos (Mordred) takes a back seat in this episode; although the moments he is on screen he utilizes fully, particularly one tense conversation with Merlin where the mutual distrust that both characters feel for the other oozes off screen. Katie McGrath is also brilliant again as Morgana, not being melodramatic in her frustration and determination to capture Finna. She is the perfect villain, powerful but also vulnerable and easy to get a reaction out of. This episode ends on a cliff-hanger that certainly signifies the end is nigh – Morgana sends a message with the death of a knight due to old magic, signalling that war has begun. The antepenultimate episode of the series is certainly a treat and truly brings out the acting talents of Alexander Vlahos’s Mordred as this episode centres mostly on him. While investigating an attack on a group of Camelot knights, Mordred stumbles across an old friend (and love) of his – a woman named Kara (played by guest-star Alexandra Dowling). He lets her escape, but she is later found and sentenced to death for killing the soldiers. Her lack of remorse and tenacity in a powerful scene with Arthur (Bradley James) allows the audience to not feel much sympathy for her character, as it is clear her belief that Arthur is the enemy is so rooted that it cannot be changed. Mordred attempts to change Arthur’s mind about her sentencing, telling him the truth and confessing his love for her. Arthur (sympathetically) refuses and so Mordred launches an escape attempt – Merlin leaps into action, telling Arthur of Mordred’s plan, allowing them to catch the pair. As Kara is put to death, Mordred seeps into despair and rage; escaping from his cell, he disappears and makes his way to Morgana. In a delicious cliff-hanger he tells Morgana the information she has longed to hear – the true identity of Emrys: Merlin. This episode is filled with some standout, solid performances – particularly Vlahos’s Mordred. Mordred has always been lingering in the shadows, with the audience never knowing what his true motives have been, and now he moves into the forefront and Vlahos is able to fully flex his acting muscles. He succeeds in making the audience feel sympathy for his character in his torment about what to do about Kara – he loves her, yet he is so shocked by what she has become. Vlahos and Colin Morgan have some fantastic scenes together in this episode, filled with tension and mistrust – you can really feel the frustrations that have been building throughout the series. The heartbreaking scene where he asks Arthur to reconsider his decision is also stunning – truly a series best performance from him. Colin Morgan also puts in a fantastic performance, particularly the second half of the episode as he tries and repairs the fragile situation. He is soon out of his depth and you can see the weariness and lack of confidence in his decisions by the end of the episode, when he realises that he cannot save Mordred from going down the path to evil. Bradley James also puts in a stellar performance as Arthur must struggle with the decision he is making – his relationship with Mordred has been a close one, with a bond and a trust forming, and even though Arthur tried to help, offering Kara a way out of her death, she threw it back in his face, choosing death, and thus fixing Mordred’s turn to the dark side. The ending and the truth of Merlin’s true identity is a perfect set-up for next week’s finale two-parter. I cannot wait to see what the writers have come up with to end this fantastic series, which has truly found its stride in the last season. Arthur: I’ve made a terrible mistake haven’t I? So since I became employed full-time I have not had nearly enough time to write reviews on TV shows I keep up. In fact I have not had enough time to even watch said TV shows. I have only managed to keep up with one or two TV shows a week, however Merlin was first on my list to catch up fully on. The only reason I have not managed to watch it on TV is scheduling conflicts with The X Factor. So now that I’ve FINALLY caught up, I thought I’d write something about how the series is progressing so far. It is fair to say that Series 5 has definitely been the best season of Merlin so far, full of drama, suspense, action and that classic Merlin humour. The series has progressed with Merlin keeping a watchful eye on Mordred, as his true loyalty is constantly questioned. Whilst Merlin believes he is a threat, an even more real lies outside of Camelot in the form of Morgana, constantly cooking up schemes to get to Arthur to finally reclaim her throne. It seems this series Morgana is coming closer than ever to finally getting what she wants, and the series takes unexpected twists and turns, playing out the classic Arthurian legend. Some stand out moments from this series include the third episode where we see the welcome, brief return of Anthony Stewart Head as Uther Pendragon, terrorising the inhabitants of the castle as a ghost, and the episode ‘The Dark Tower’ which sees Morgana capture Gwen and haul her off to the mysterious Dark Tower. After the events of this episode Gwen is different, and it doesn’t take long for Merlin to realise that something terrible happened to Gwen when she was with Morgana. Now that Morgana has her very own puppet in Arthur’s circle, the attempts on Arthur’s life are far more perilous and the last episode saw Merlin and Arthur journey to try and break Morgana’s powerful spell. With the help of magic and the power of true love, Gwen was reversed back to her true self however with only 4 episodes left of Merlin; the path is certainly being laid out to an explosive finale. Sadly, 2 weeks ago it was announced that this series of Merlin would be its last; the creators Johnny Capps and Julian Murphy always said that they felt Merlin was a 5 series story arc that they could tell and they have stuck to their guns and brought a series to a dramatic close with the 2-parter which will air over Christmas. It didn’t mean I wasn’t wholeheartedly disappointed (I’d grown to really love Merlin as a shoe, and was even looking forward to this series more than the start of Doctor Who) however, I respect their decision to leave now bringing the story to its natural end, rather than being pushed out. I look forward to the final few episodes of this fantastic British series (and also for when X Factor ends so I can watch Merlin as it airs).